I have super exciting news… I am flying to South America on Monday for a two week adventure! But this means I need to get my packing essentials for Peru together,and fast. I’ve always wanted to visit Peru, it’s been on my bucket list for a very long time, and my excitement is palpable. And as this is my first trip to South America, I’ve been busily researching and planning over the last couple of months for this once in a lifetime experience. There have been so many factors to consider and plan, including various vaccinations and what to pack. Note to anyone getting the Yellow Fever vaccination – you will get a nasty, nasty virus from it so be prepared! I’ll be adventuring to some of the most beautiful places in Peru including Machu Picchu, Lima, Sacred City of Caral, Paracas, Huacachina, Nasca Lines, Sacred Valley and lots more. As I’ll be doing a lot of varied activities, I need to make sure I pack the right clothing and equipment. So with this in mind I have compiled a list of my packing essentials for Peru. STAYING CONNECTED I recently introduced a new addition to my travels, my new Microsoft Surface Pro 3. 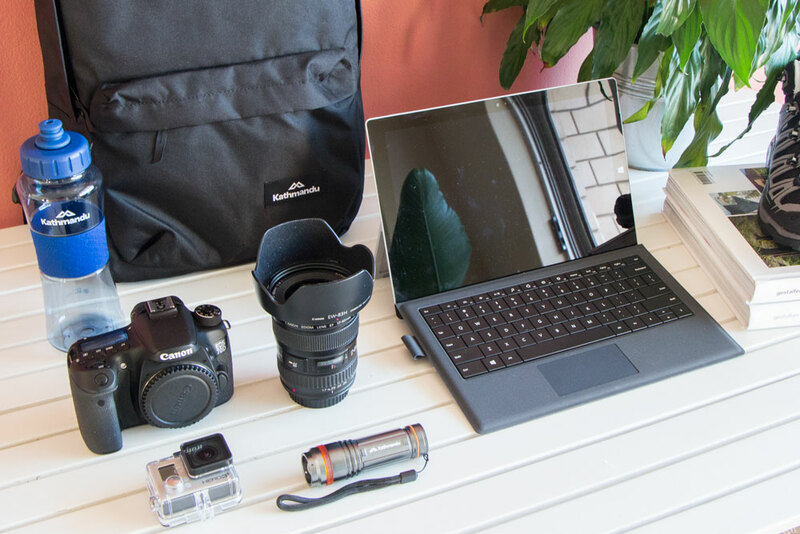 Over the next 12 months I am taking part of the Microsoft Australia #WorkWonders program so you’ll be finding out a lot more about the Surface Pro as well as how its products and features, such as Office, help me on my travels. I usually take my other laptop but it’s so heavy to carry around on my travels. So I’m excited to take something lighter and more compact to Peru. It fits snuggly into my backpack and I’ll be able to Skype loved ones back home, blog on the road and take photos. I’ve also kissed my notebook and pencil goodbye in favour of using One Note to compile my lists, including my Peru packing list. It’s a mind-blowing feature where I handwrite notes using the Surface Pro Pen and then transform these notes into a Word document. So useful! SNAPPING PHOTOS In addition to my Surface Pro, I’ll be taking photos on my new baby – my Canon 70D. I am pretty excited to be shooting landscapes with my new wide lens and have been researching nature photography tips online over the last couple of months to ensure I capture some beautiful photos. I have also finally invested in a GoPro! I used my friends in Bali and needless to say, it was a lot of fun. I’ll be shooting video on all three devices and compiling some great adventures for Mister Weekender TV, so stay tuned. GOING HIKING Whilst I am in Peru, I’ll also be hiking Choquequirao - a 42km hike over four days. After my experience at Cradle Mountain in Tasmania earlier this year I have made sure to pack the best hiking gear possible. So I went to Kathmandu and picked up a pair of hiking boots, hiking pants, a long line hooded jacket and a daypack. I also picked up a water bottle and torch. This gear will also be fantastic for hiking Machu Picchu - oh my goodness I am so excited! !